It's nearly been two years since the first ever IpBoG. We should probably do something fun. Well, board games are always fun, but something a bit different maybe. I was throwing around the idea of having a two player game day and people seemed pretty into the idea. Our anniversary is the last week in March which is two weeks away from now so don't forget to brush off your copies of Star Realms and Andriod: Netrunner. 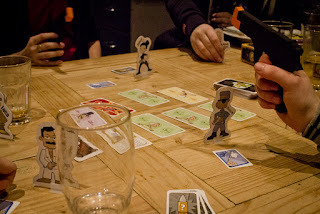 I'll probably be bringing Imperial Settlers, okay it's not a two player game but I'd never play it with any more than two people. Anyway, to the blog proper. We got something like 21 people this week, it's getting hard to count the exact amount. I arrived to fine people already playing Ca$h 'n Gun$ and also (I think) Zombies!!! I brought Mythotopia again and we got through it much quicker this time and cleaned up a couple of rules errors. I snuck in late for the win but it was pretty close and could have been anyone's game. Afterwards I played Tiny Epic Galaxies. I game Philip a hint as to what he could do and he did it, losing himself (and me) the game. This is the last time anyone takes any of my board gaming advise. 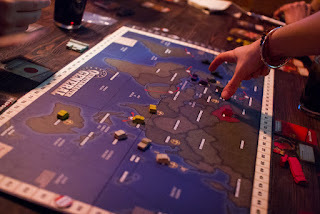 Mike brought Quartermaster General which made it's IpBoG debut. It's a team game with three people on each side, each player controlling a different country on either the Axis or Allied side. Dan brought For Sale. He'd been holding out for the recent Asmodee version which has super nice art and super nice components and, not wanting show show off but, is the one that I own. It's pretty hard to get hold of though, at least for a price that isn't totally extortionate so he finally caved and bought the English version. Danny had bought the Revolución expansion for Mafia de Cuba which I think went down well. A bunch of other games were played including, but not limited to, Coup and Blueprints. I'm sure others were played but I was caught up on the other side of the bar so didn't get to see them all. Blueprints - Ca$h 'n Gun$ - Coup - For Sale - Mafia de Cuba - Mythotopia - Quartermaster General - Tiny Epic Galaxies - Zombies!! !